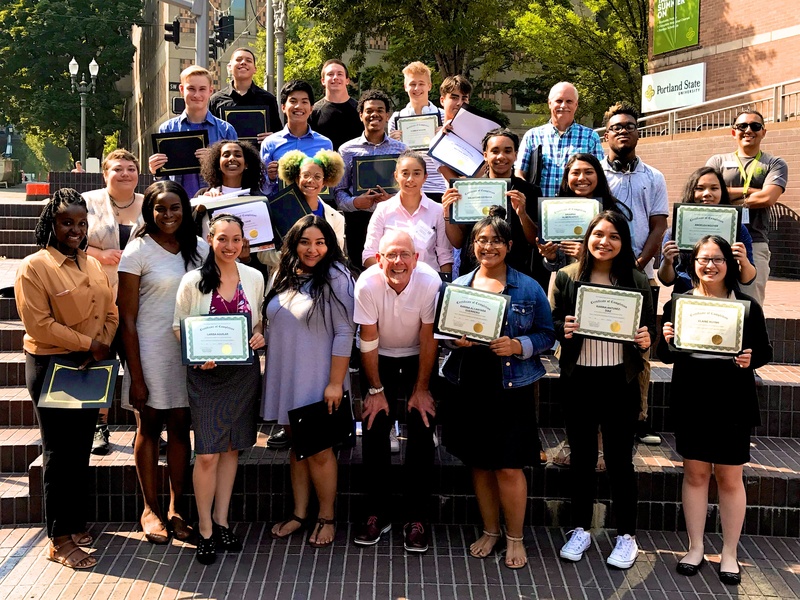 PSU’s Summer Business Institute provides high school students an introduction to the Business School and a brief glance at college life during a 4-day, 3-night on-campus visit. Participants are either entering their Junior or Senior year of high school – a few just graduated. I’m with them every day from 9AM to Noon. Following lunch, they visit local companies to learn how business school practices are put into practical application in the real world. Past company visits include: Nike, Franz, Columbia Sportswear, Costco, Adidas, Fred Meyer and Wieden and Kennedy to name just a few. Solve a societal need – provide a solution to what they believe to be a critical social issue. While I am a big believer in the need for non-profit business structures, I challenge these students to solve a societal need by creating a for-profit business. Why? Because I’m a Michael Porter groupie and I completely buy into the concept of Creating Shared Value and the need, and the opportunity, for business to solve societal ills. This shouldn’t surprise anyone reading this if you are familiar with KO’s client base. We spend way too much time in our education system lecturing and way too little time facilitating learning. I love listening to their theories of what’s troubling our society and how they would solve those troubles through the establishment of job-creating, community enhancing, tax-paying businesses. Companies that bring water to water-starved locations around the globe, grow and distribute food in food deserts, and numerous business models that surround the concepts of Reduce, Reuse and Recycle: fashion apps that help you piece together new outfits from the clothes you already have; apps that allow you to create new clothes from your old clothes; and concept after concept and app after app that addresses and redistributes the 40% of food wasted every year in the U.S. Impressive to say the least. But, listen to their pitch on Day #2. It never ceases to amaze me at how quickly these young minds grasp one of the most important aspects of marketing positioning that, often, can take us months to develop in the real world. They truly inspire me and teach me. I wish I had more time in this blog piece to tell more amazing stories of these equally amazing students. Instead, I’ll end with this challenge to you. These young women and men are our future and they are in desperate need of your time, knowledge and mentorship. You have so much to teach them, and they have so much to teach you. Fortunately, there are many opportunities for you to get involved with them. If you need some ideas, write me, I would love to help.